Lama Zopa Rinpoche visiting Khyongla Rato Rinpoche on Chokhor Duchen to respectfully make offerings to a beloved guru, New York, USA, August 2016. Photo by Ven. Lobsang Sherab. 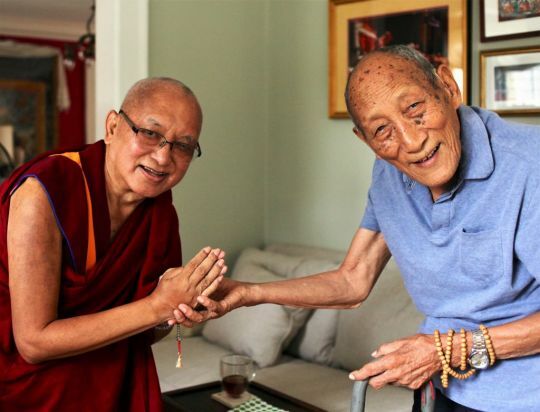 A student wrote to Lama Zopa Rinpoche saying that he felt no one liked him. Rinpoche responded as follows. When you had very negative thoughts before, thinking “nobody loves me, no one cares for me etc.,” you had so much unhappiness made by your own mind. You had that very unhappy mind for a long time. You have been thinking that the numberless buddhas and bodhisattvas do not love you; they don’t care for you, you are completely left out, and they let you suffer. This way of thinking shows that you do not have renunciation of attachment, and also not an understanding of bodhichitta or emptiness. Actually they cherish you one hundred thousand times more than the amount you love yourself. If they did not love you and cherish you, then you would not be a human being in this life. And even if you were, you would not have created all the virtues that you have, so much benefit for sentient beings would not have happened, and all this Dharma education you would not have. All of this, so much, so much, so much—you would not have. It is important to understand the meditators, monks, nuns, and also lay people who are living in renunciation. Renunciation means to renounce attachment to this life, to future lives, to samsara. So they do not feel “nobody loves me.” They are so satisfied; they have inner peace and happiness. The stronger the renunciation, the more peace and happiness inside. 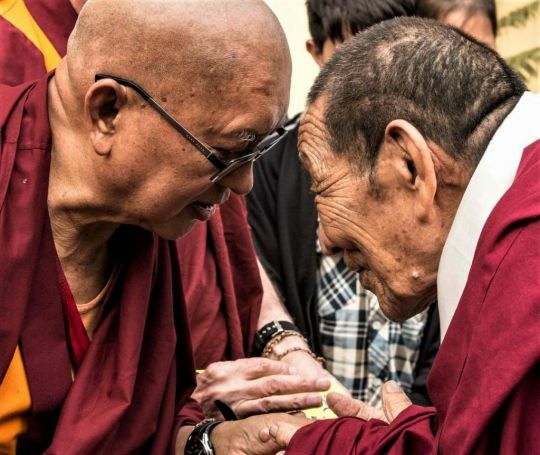 Lama Zopa Rinpoche greets Lama Monlam in Sarnath, India, January 2017. Photo by Paolo Regis. Many people do not know this. They think that to be brought presents, flowers, and cakes makes them sooooooo happy. But to generate the two bodhichittas, loving kindness, and compassion is not attachment. 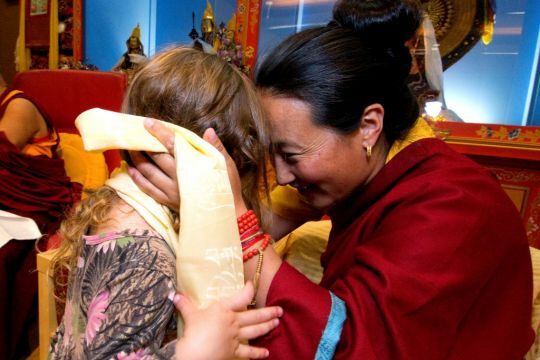 Like a mother, in just the way she cherishes her child, so the meditator cherishes numberless hell beings, preta beings, animals, human beings, suras, asuras and intermediate state beings, and all sentient beings—and then generates the precious thought to achieve full enlightenment for all these mother sentient beings. From this there are skies of happiness and peace. This is very important news. This can be very helpful for many other people, be they students or just ordinary people. The sadness, feeling alone, that no one loves you, this comes from attachment to this life. That’s why they need renunciation. This is the antidote that brings inner peace and happiness. It means the mind becoming pure Dharma. The great ascetic Tsangpa Gyare [the founder of the Drukpa lineage] who is the savior of transmigratory beings, said, “Do not lose the auspicious connection with the valid perfect one. Even if you lose auspicious connections with everyone else, so be it. But if you lose the connection with the valid perfect one, then even if all transmigratory beings become your relatives—what is the use of that? Khadro-la (Rangjung Neljorma Khadro Namsel Drönme) at Maitripa College, Portland, OR, US, June 2012. Photo by Marc Sakamoto.